December 9, 2016, will be the 110th anniversary of Admiral Grace Hopper’s birthday. 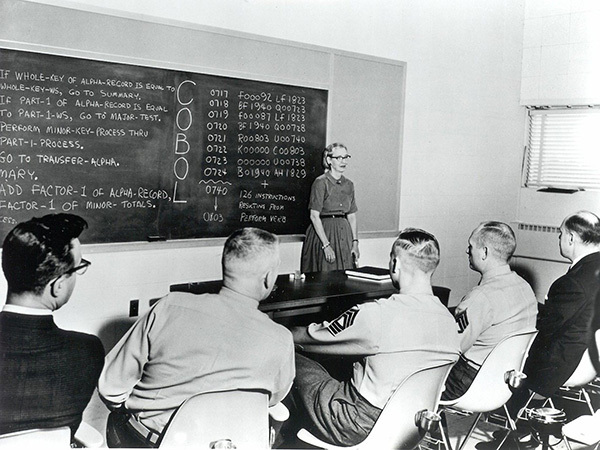 Admiral Hopper was a pioneer in computer programming who created the first compiler and whose ideas lead to the creation of COBOL. An apocryphal legend also credits Admiral Hopper with coining the terms “bug” and “debugging.” The GSA’s IT Digital Service Team will celebrate Admiral Hopper’s birthday with a beginner-friendly hackathon. The Grace Hopper Day Hackathon is the perfect hackathon for beginners. Almost all hackathons are great ways to start coding. You might think that hackathons are only for experienced developers who subsist off energy drinks and junk food while building incredible apps in just a few hours. True, there are experienced developers who create some amazing innovations after marathon coding sessions. However, beginning developers and non-technical people can also play an important role on a hackathon team. The main purposes of hackathons are for learning and for building relationships. If you are interested in learning to code or just interested in seeing how a programming project comes together, hackathons are the best way to ask questions and watch developers tackle a programming challenge. Many developers are happy to answer questions and mentor beginning programmers. Also, the experienced developers often need help for non-coders. For example, you might have some project management skills that can help organize the development project and help the team to produce a good app at the end of the hackathon. You might have design skills that will help in building the user interface and produce an attractive branding for the app. You could also play the vital role of the subject matter expert. Your advice and real-world experience will help the developers to produce a solution that solves a long-standing problem. “The competition is for all open source contributors to redesign the GSA Open website, open.gsa.gov. Open.gsa.gov is the current developer portal for all GSA data, APIs, and source code open to the public. Visit the frequently-asked questions (FAQs) page and read through the FAQs. You may also want to visit the GitHub page and the Open GSA wiki. Don’t worry if you don’t immediately understand what is on the GitHub page and the wiki. Just make a list of questions to ask on the day of the Hackathon. Then, make sure to arrive at the hackathon early. Take the time to network and review any materials given out. Attend the opening assembly so that you don’t miss any important logistical information. After that, join a team or, even more adventurous, recruit for your team. Have a problem or challenge you want to offer that other team members will rally around. Then, jump in and have fun. Once you have attended your first hackathon, I’m sure you will want to attend more. Where else can you learn about technology, make great friends, and make a difference in just a few short hours?Each week, The Data Briefing showcases the latest federal data news and trends. Visit this blog every week to learn how data is transforming government and improving government services for the American people. If you have ideas for a topic or have questions about government data, please contact me via email. Dr. William Brantley) is the Training Administrator for the U.S. Patent and Trademark Office’s Global Intellectual Property Academy. All opinions are his own and do not reflect the opinions of the USPTO or GSA.